As a small business owner, you’ve no doubt heard plenty of hype about payment services like Square and Stripe Payment (or Stripe), each of which was founded as a way to give small businesses more control over how and where they accept payments from their customers. Each company has founded to serve a different type of business, however. While their services have changed and expanded over time, their roots remain evident in the types of payments accepted, the ways in which payments can be charged, and their implications on small business owners. The company now known as Square, Inc., was founded in 2009 by Jack Dorsey, one of the founders of Twitter. The goal of the service was simple: Allow merchants of any size to accept payment via credit or debit card on-the-go. Up until the founding of Square, most payment processing companies required merchants to pay extremely high monthly fees, purchase specialized equipment at a premium, and pay a percentage of all payments received to the processing company. If you’re considering using square, you should keep in mind that the service earns rave reviews for its signup process, affordability, and great ease of use within both its apps and web-based account management tools. Retailers simply have to provide their small business’ name, relevant contact information, and a few financial details, like a depository bank account. With this information, an account is opened and a free “Square Reader” is sent to the business’ physical mailing address. The Square Reader is a tool that transformed small business payments and continues to be unique in the marketplace. The device, which is about the size of a quarter, plugs into the headphone jack of an iPhone, iPad, or Android device. Once connected, the Square Reader identifies itself to the Square mobile app and can be used as a magnetic stripe reader for Visa, MasterCard, Discover, and American Express credit and debit cards. When a total is entered into the app, and a card is swiped through the Square Reader, the payment is approved or declined instantly; funds are available for next-day deposit in most cases, though balances over $50.00 can be deposited to a bank account instantly. Instant deposits do occur an additional, 1-percent fee, however. Square Chip Card Reader: Originally designed for international markets, this chip card reader is now offered to American merchants as well. This hardware option, which looks virtually identical to the original Square Reader, has a dual-reader design that allows chip cards to be inserted on top, or stripe cards to be swiped in a left-to-right motion. The device requires a one-time purchase fee of $29.00. Square Contactless and Chip Reader: The newest Square Reader option incorporates chip card compatibility and NFC payment technologies. Compatible with Apple Pay, Android Pay, and chip cards from the U.S. and abroad, this $49 reader is considered the future of Square’s in-person payments hardware business. It should also be noted that Square offers a robust Register app and online portal, both of which can be used to generate and send invoices, request and receive online payments from customers, manage financial transactions, and incorporate Square payments into traditional website designs. In fact, a full Square API allows for shopping card and “digital goods” integration on small business websites with ease. The Square API is also incorporated into several e-commerce plugins for WordPress and Drupal, making it newly competitive for all-online payment processing. Stripe was founded to focus exclusively online payment processing, and the company has maintained that laser-like focus in the five years since it first began offering its services to small businesses. Stripe’s nearest traditional competitor is actually PayPal, which has long been an all-digital payment service for online goods like software. because of its focus on small businesses and its integration into existing websites, however, it is often lumped with Square competitively and in the media. Stripe charges 2.9 percent per transaction. The company also charges a flat, 30-cent fee for each transaction. 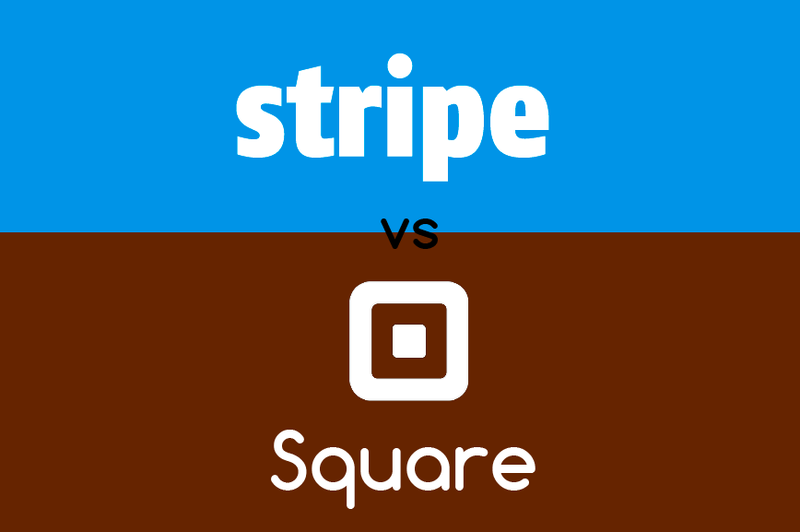 You will find that Square will also charge the same rate for online payment processing. Stripe also handles its mobile application a bit differently. With Square, the company’s “Register” app is both a payment processor and a transaction manager, allowing its users to both charge a customer and review past transactions, deposit funds, or make financial account changes. The Stripe app has more limited functionality, focused primarily on monitoring the status of existing transactions that are taking place on a company’s website. With that said, Stripe has one advantage over Square that is likely to remain for some time: The company’s Stripe API is far more advanced than what Square has to offer. This means it’s easier to incorporate the Stripe payment service into CMS software, shopping carts, and other third party apps in a way that is seamless, “native,” and without Stripe’s own branding. The experience is therefore far more seamless for customers and, in many ways, superior from an end-user perspective if your company doesn’t transact offline. So, Which Company Offers the Better Payment Processing Solution? Square is the better choice for companies who have retail stores, a high sensitivity to transaction fees, and a desire to turn mobile devices into sleek, Internet-connected points of service. The company’s low fee structure, and continued innovation in terms of instant deposits, API hooks, and online payments, also means that most customers will be able to stick with Square for the long haul. Stripe is the top choice for companies that operate only online and need both a low-cost solution and one that plugs into an existing website seamlessly. With its ability to be integrated into most CMS solutions, branded with a company’s own logo and design scheme, and incorporated into payment schemes for digital goods, subscriptions, software, and more, it’s the perfect solution for digital vendors.